I have a confession to make. Ever since I started traveling regularly in 2016, I would catch a cold on every single trip. Some days it was just a few days after I arrived in another country, and other times it was a few weeks later. I figured this was just the price I paid for traveling. 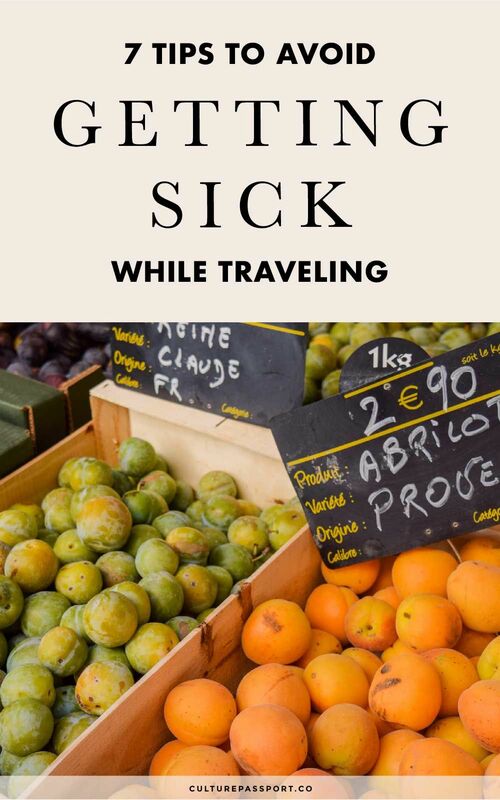 It wasn’t until I ended up in the hospital in Madrid for an adult version of strep throat that I decided that I had to seriously research what to take to prevent getting sick while traveling. Getting a cold while traveling is really common I learned. Planes are basically magnets for germs and they aren’t cleaned very well in between flights. That being said, planes aren’t the only way you can get sick. There are many reasons why you could be getting sick while traveling abroad including being exposed to new germs and viruses you don’t have back home. 1. Take a multivitamin regularly – Ever since I started taking multi-vitamins I no longer have to worry about getting in my daily fruits and vegetables. I know, I know what you’re thinking – a multivitamin isn’t supposed to be a substitute for healthy eating! That’s true, but I love that it’s there for those days when I’m stuck in the airport with limited food options or in between healthy grocery tips. Taking a multivitamin also helps prepare your immune system for battling a cold. I take this organic one once a day and get 100% of my daily value nutrition! 2. Drink an Emergen-C the day before you travel – I drink one Emergen-C packet the day before I travel to give myself that extra Vitamin C boost before entering into the metal tube full of germs. 3. Use Hand Sanitizer – I always carry around a travel sized hand sanitizer when I’m traveling. Even when I go out to the grocery store, or anywhere that attracts a lot of people, I always use my trusty hand sanitizer when I’m done to get rid of any germs I may have picked up. 4. 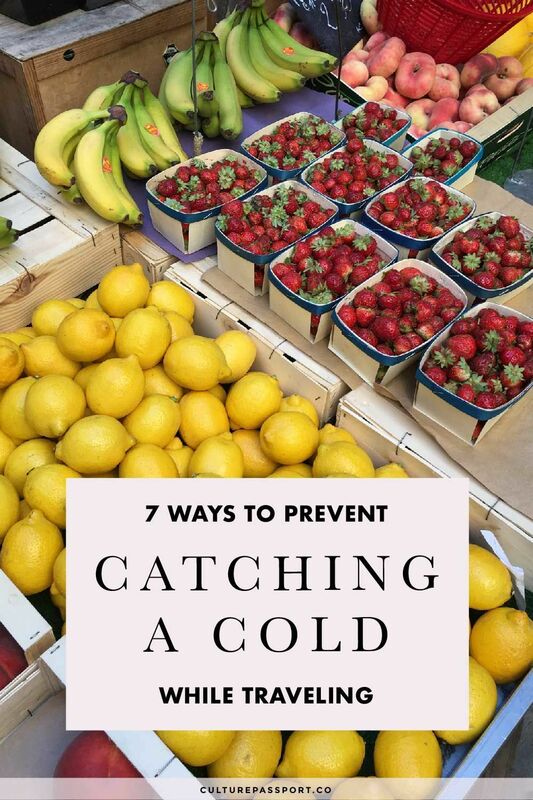 Eat plenty of fruits and vegetables – It’s cliché but so true: eating tons of fruits and veggies is the best way to prevent getting sick while you travel. 5. Take an immune booster – If you more or less eat healthy and take your vitamins, but you still feel that you need some extra protection against sickness, then I’d recommend speaking to your doctor about taking an immune booster supplement. I take a Beta Glucan supplement to keep my colds at bay. 6. Wash dishes before using them – If you’re staying in an Airbnb, then be sure to wash any dishes and utensils in the apartment before using them. Airbnb hosts may only wash the dishes that were left in the sink by the previous guests, but who’s to say how good a job the previous guests did with the dishes they washed themselves? I don’t take the risk and just wash everything before using them. 7. Bring Lysol spray with you – Lastly, I try to clean my hotel or Airbnb with a travel size Lysol spray when I first arrive. You can also use it to clean your tray on the airplane! I hope this post helped you learn how to avoid getting sick while flying and traveling abroad! Being sick is never fun and with the right habits, you can prevent it!